PITTSBURGH, PA - The Art Institutes schools are announcing sponsorship of The Art Institutes Storytellers Photography Competition 2010. The competition offers a chance to creative high school seniors graduating in 2010 and high school graduates in the U.S. to put themselves in the running to earn a scholarship in an amount up to $40,000 to one of the 31 Art Institutes schools offering a photography program. “The Art Institutes created this competition to encourage and reward creative thinkers whose talent can be seen through the lens. We are pleased to sponsor a photography scholarship opportunity for those interested in pursuing an education at one of our schools,” said John Mazzoni, President, The Art Institutes. The competition has separate categories for high school seniors graduating in 2010 and for high school graduates. The grand prize winner in the high school senior category earns up to a $40,000 scholarship to an Art Institutes school offering photography. The grand prize winner in the high school graduate category earns a $10,000 scholarship to one of The Art Institutes schools offering photography. Entrants are asked to submit eight original photographs that tell a story on a single theme, a 500-1,000 word artist statement describing the entry and a high school transcript demonstrating a GPA of 2.0 or higher or proof of high school graduation. For complete entry details, please visit http://www.artinstitutes.edu/pr.aspx?ID=ai1027. The deadline for entries into the competition is March 5, 2010. 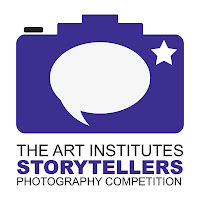 For more information on how to enter The Art Institutes Storytellers Photography Competition and for official rules, visit http://www.artinstitutes.edu/pr.aspx?ID=ai1027. The Art Institutes (www.artinstitutes.edu) is a system of more than 45 education institutions located throughout North America, providing an important source of design, media arts, fashion and culinary arts professionals.